As I'm starting to get back into the swing of things in regards to my health (mental & physical), as well as returning to the world of academics, I've rediscovered inspiration to start blogging again! I find that it eases any anxiety that manages to sneak up on me, which is always a plus haha. This recipe is nothing new and/or innovative, but I still felt it needed to be included in my "recipe filing cabinet" that is my blog for future reference because it's so simple yet so good and has helped me stay on the right track. I've been munching on this as part of my pre and post workout meals. It's also been my go-to snack for when I'm studying--no surprise since couscous contains loads of fiber (digestion), B vitamins (energy), lean vegetarian protein (muscle replenishment and fuel), and good fats (cholesterol) among many other benefits. Cook cous cous according to package instructions (I usually do 1 C to 1 1/2 C cous cous to h2o ratio) in a medium saucepan or microwave. Fluff cous cous with a fork, then set aside to slightly cool off. Steam corn, then remove kernels from cob. Chop up tomatoes and pepper. Combine all ingredients in a bowl. Season with salt and pepper. Mix. Drizzle with extra-virgin olive oil. Mix. Add lime juice. Mix. Refrigerate for at least 20 minutes until ready serve. Enjoy!! 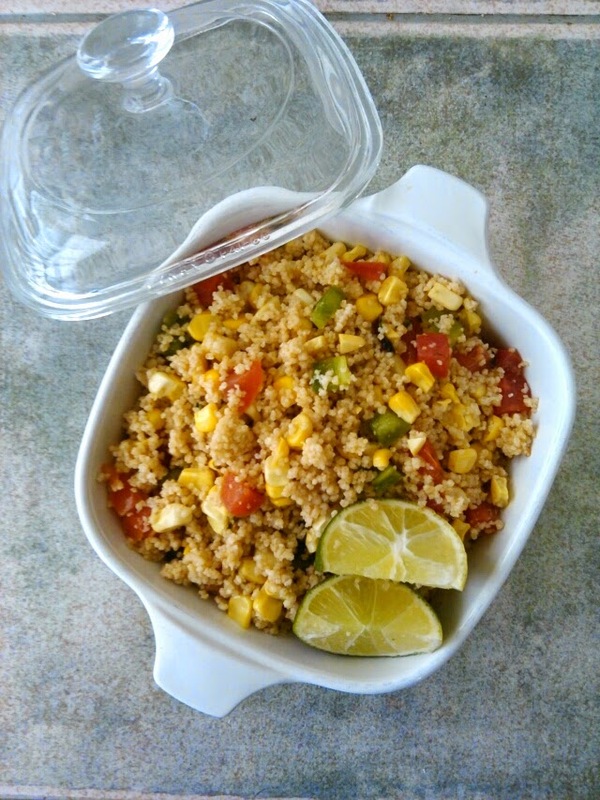 Another beautiful thing about couscous, like many complex carbs is its versatility. You can eat it as is, heat it up for a nice side dish, or even stuff it into bell peppers and bake for a comforting vegetarian meal after a long hard day. I've read as well it can be made into a dessert, so I'll be looking into that. Exciting! Until then, I probably should get back to studying now.